Writing scripts to automate administrative tasks can be challenging. 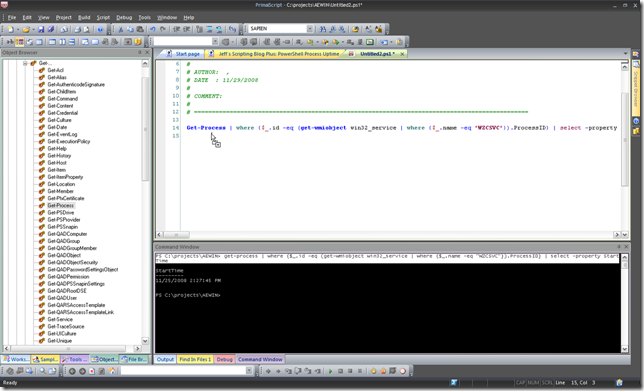 Not only do you need to master the particular scripting language you intend to use, you also need to find the right object and technology for the task at hand. PrimalScript 2009 makes the development cycle of Discovery – Experimentation – Implementation that most script authors use much more efficient. 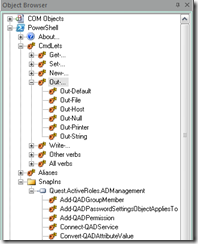 The new object browser in PrimalScript 2009 gives you access to the most commonly used type of objects; COM, PowerShell Cmdlets, WMI and the .NET framework. Each of these nodes shows the underlying objects in an organized, easy to understand way. 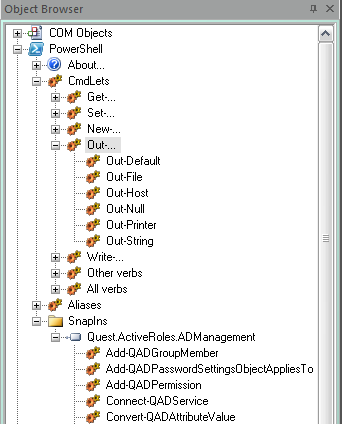 In this example you see the presentation of PowerShell Cmdlets organized by verb or by SnapIn, along with other important PowerShell items, like Aliases and About articles. You can simply right click on any of these and look at the online help, or Google for additional information or simply copy the name of the item to the clipboard. Once you have fine tuned your exact call or expression for a Cmdlet, you can simply select and drag the completed code to your script file. In future blog posts we will show you how the new object browser can help you discover other objects and their uses easily and quickly; all from one single location within PrimalScript 2009. Hey, can I ask you guys to post full rez screenshots? Those tiny ones are for the birds. I’ll see what we can do. Don’t forget you can always click an an image. Most of the time they are thumbnails in the blog post and click the image will display the full image. Yes, I know you can click. 🙂 And _those_ were scaled down images, which was why I commented.